OMG Posters! 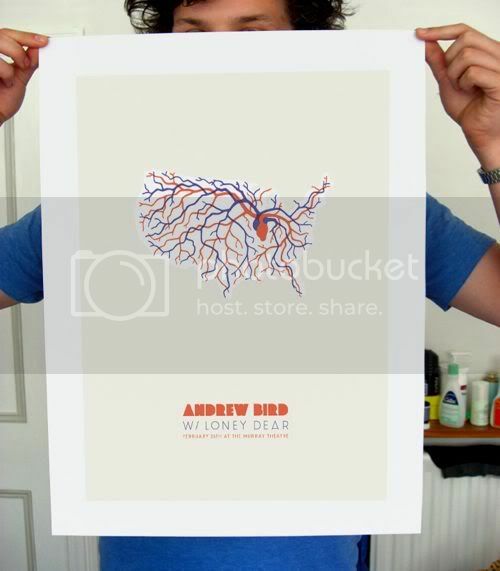 » Archive Andrew Bird Poster by Brandon Knowlden - OMG Posters! Brandon Knowlden is just getting started designing posters, this is actually his first one ever. It’s an 18″ x 22.5″ screenprint, has an edition of 100, and is $30 shipped. Pick one up in the Gigposters.com Classifieds. i looks a lot like some posters i did four years ago. Andrew Bird is from Chicago and still lives in Illinois. I turned Illinois into a heart to represent that his hometown pumps the lifeblood of his North American tour. The veins flow to all of his show locations and many more. I’m just not really impressed with this. Seems stale and trite.